Individuals who are writing official government texts may want to invest in translation software tools, which can perform a spelling and grammar check before an embarrassing typo is printed. Unfortunately, officials from the Forbidden City in Beijing opted not to use this trusty device. According to USA Today, although many companies decide to expand their businesses overseas, it is sometimes not as easy as it sounds. The best way to really know about a company’s product is to ask the Director of Product Development herself what she has to say. Ms. Laly Bar-Ilan is the Director of Product Development at WhiteSmoke, Inc. and there is absolutely nothing she doesn’t know about the WhiteSmoke products. Spain currently has an unemployment rate of about 20%, which is twice as high as the European average. According to the New York Times, more and more Spaniards are searching for employment opportunities abroad. Of New York City students who entered the school system in the first grade, only 36 percent were able to pass an English language proficiency test last year during the seventh grade. Business professionals need to ensure they have concise and effective writing styles that communicate their meaning precisely. A number of ambitious studies have worked to map the frequency of such errors in common use, according to you-can-teach-writing.com. The seemingly minor grammatical difference between the words "doing" and "did" can alter the very outcome of a criminal verdict, according to a new study published in Psychological Science. In today's global marketplace, the translation industry is burgeoning. U.S. companies may have multiple international clients with whom they need to communicate effectively. Playing down one's linguistic skills - no matter one's facility - may prove beneficial in certain business communications, according to the Deseret News. Whether they are hand-written or printed, signs, banners and billboards serve as the public face of a business or individual. A good review of one's grammar and spelling can keep one from making signs that might turn consumers and clients away. Two months ago, the vice president of Samsung, Lee Young-hee, was misquoted by the Wall Street Journal (WSJ). Due to the publishing opportunities that are afforded by the internet, individuals who wish to become authors or journalists no longer have to wait for a book deal or a job offer to share their views. According to a recent report in The Associated Press (AP), the profusion of new acronyms in writing and speech is of great interest to linguists. In recent years, educators have placed a decreased emphasis on holding extensive English grammar lessons. However, some members of this industry are working to reverse that trend. Over the past several years, the higher education industry has seen many changes. The demand for quick, convenient learning options has caused many institutions - including Tri-Valley University - to come under a great deal of scrutiny. Over the past few days, headlines about the NFL playoffs have been littered with spelling and grammar errors. The latest publication to join this unfortunate category is The New Orleans Times-Picayune, Yahoo! Sports reports. Many writers and editors rely primarily on their own eyes to find errors in their copy. However, individuals who fail to run a spelling and grammar check on their pieces before they are published may be subjected to public humiliation. For many professionals, a grammar check is a common part of their work. For some, however, failing to complete this task could severely impact their credibility. For decades, teachers have been pleading with their students to check for grammar and spelling mistakes before turning in their assignments. Now, many education professionals are preparing to introduce technological tools that are intended to ensure the quality of students' writing. The English language has many different dialects. As a result, individuals who are planning on moving to a new region of the country - or a new nation altogether - may want to educate themselves on their new neighbors' manner of speaking. In many cases, a simple grammar check can ensure the quality of one's work or a company's product. One Connecticut-based publishing company could have benefited from such an overview - and a fact check - when it was compiling a history textbook. WhiteSmoke, featuring the WhiteSmoke Translator and Writer, has been accredited by leading antivirus companies. Delaware, December 08th 2010 – WhiteSmoke Inc. (www.WhiteSmoke.com), provider of world-leading English writing solutions, have announced today the launch of ‘WhiteSmoke’. ‘WhiteSmoke’ is the first writing solution to combine grammar, spelling, and writing style correction tools with a full-text translator. ‘WhiteSmoke ’ also includes a multi-lingual dictionary and hundreds of templates for a variety of different writing scenarios. There are 41 million BlackBerry users worldwide, 59% of them check their email the second it arrives, and over 40% of them check their emails no matter what situation they find themselves in. WhiteSmoke, Inc. - Wilmington, DE. Sept. 15th, 2009 – WhiteSmoke announces the immediate availability of WhiteSmoke Writer , the upgrade from WhiteSmoke 2009. The launch of WhiteSmoke Writer is accompanied by a huge competition, with a round-the-world plane ticket for the winner. Today WhiteSmoke released a new grammar engine for its world-leading English writing software. The 4th generation engine brings a wealth of improvements, including additional error detections, improvements to grammar algorithms, and faster server response times. WhiteSmoke, leader in English writing technologies, announces a new tool designed specifically for people with writing difficulties – WhiteSmoke Writing Assistant. Those with family and friends with dyslexia and other writing difficulties know how hard it can be to write an email, letter, or essay without errors. WhiteSmoke announces the immediate release of a major update to the server-side component of its English writing software, the result of 8 months of intensive development, the analysis of millions of sentences, and extensive customer surveys. A client update for download onto the user’s PC will be launched in the following days. It might surprise you to learn that National Grammar Day exists, but it’s true. This "holiday" was set on March 4th, 2004 by SPOGG: The Society for the Promotion of Good Grammar. SPOGG is a grammar-based organization that was started by Martha Brockenbrough. Just this week the Telegraph in in the UK reviewed the Business Version of WhiteSmoke in its Business Technology section online. read excerpts from this WhiteSmoke review and other recent WhiteSmoke reviews here. 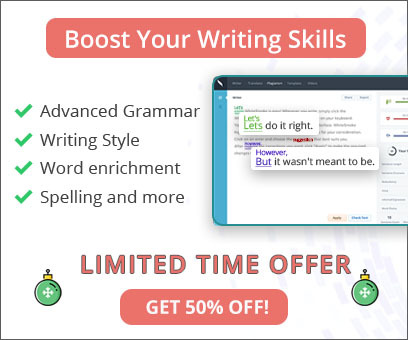 Around a month ago, we quietly launched a couple of free tools for writers and English learners, right here on WhiteSmoke.com. After the initial period of use and testing, time has come for an official announcement :). 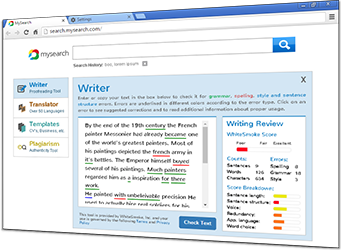 the two tools are our online checker for your writing, effectively bringing WhiteSmoke's core features to your text for free, and our free online dictionary, which features definitions, synonyms, antonyms, and a translation module for every word. Today we offically announce the new iteration of the WhiteSmoke Blog. We now have features for user comments, and you can search all entries by category in the right-hand column. If you use RSS feeds, visit the RSS Page to grab feeds - you can choose to subscribe to the whole blog, or to any categories that are of interest to you. The All Posts page gives you a quick view of all the blog content. WhiteSmoke announces the immediate availability of an upgrade to its desktop English writing software. WhiteSmoke 2009 is the leading software solution for the correction and enhancement of English grammar, spelling, and writing style.